In terms of exclusivity, it does not come much better than the Costa Smeralda. This exquisite section of coastline on the north-eastern corner of the island of Sardinia was ‘discovered’ by the Aga Khan and his friends in the 1960s. Their association instructed some of the most famous architects of the day to design a handful of luxury hotels to cater for persons of elevated taste and substantial means. And these buildings, they insisted, must respect the natural beauty of the area. Thus were created some of the loveliest retreats in the world – places in which the cares of the world could be forgotten as the sun shone, the water sparkled and the waiter smiled. 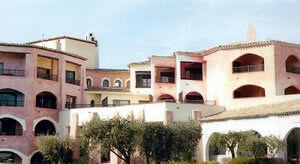 I have just answered the syren call to visit one of the very best of these hotels, the Cala di Volpe. The name means ‘Bay of the Fox’. As soon as I walked into the reception area and looked out at that very bay, bathed in sunlight and framed with distant hills, I knew that this was what my Auntie Maud would have called “a lovely spot”. I think she would have liked the building, too. Designed in 1963 by Jacques Couëlle, its style reminded me of Gaudi and Art Nouveau: organic, sinewy and white within and modestly proportioned and full of vibrant Mediterranean colours without. I soon discovered that it also had elements of a little village, with a ‘street’ of shops, its own tiny port and a covered wooden bridge. This is a place full of visual interest and delight and seems quite cut off from the rest of the world. Of the 125 rooms, mine – number 270 – was a ‘deluxe’ (i.e. standard). Half-board is the usual arrangement here, with the rate for two people in this air-conditioned apartment running all the way from 580 euros to 2,374 euros a night, according to season. Like its fellows, it rejoiced in a wonderful view (pictured). Sitting in one of the armchairs on my balcony, I looked down on the largest sea-water swimming pool in Europe and then allowed my gaze to wander around the manicured gardens, along the row of moored yachts and off across the Mediterranean Sea to the horizon. 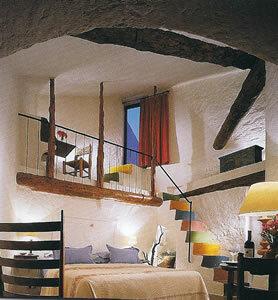 Such peaceful, civilized seclusion always makes me sleepy, so I retreated to my bedroom. Its roughly plastered white walls and turquoise floor tiles provided a stylish setting for my afternoon doze. I think I dreamt of sailing ships, perhaps inspired by the paintings of sailors which adorned the room’s furniture. I awoke, and wondered whether I should seek out the shuttle boat and have it take me to the hotel’s private beach, a five minute trip away, or whether I should find one of the hotel’s three tennis courts and perfect my serve. But then I recalled that sun worship is contrary to my religion and that I abhor all forms of physical exercize. So I decided instead to indulge in a long and leisurely preparation for dinner. The bathrooms at the Cala di Volpe (one of which is pictured) are full of hand-made ceramics and Sardinian marble, so time spent in them is particularly pleasurable. I soaked in the tub of decent length and shaved in one of the two wash basins. 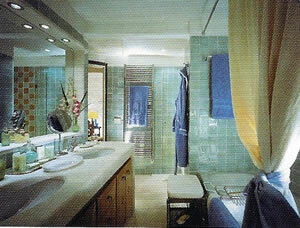 A separate shower was provided, with the loo and the bidet set apart behind a sliding door. I emerged, clean and fragrant, with a healthy appetite. Here I will pause to comment upon the members of staff I encountered, for they are worthy of comment. First, I was struck by their number. Luxury hotels should be full of eager and well-trained helpers. This one was. Second, the helpers should be there when you need them and not there when you do not. Another big tick for the Cala di Volpe, for efficiency of the discreet kind. And, finally, I do like to feel that there is a measure of genuine friendliness behind the service. Again, everyone with whom I dealt notched up ten out of ten. Marco Milocco (the General Manager) and Bart Spoorenberg (the Hotel Manager) have reason to be proud of their team. Throughout my stay, I felt very well looked after. It was time for dinner. 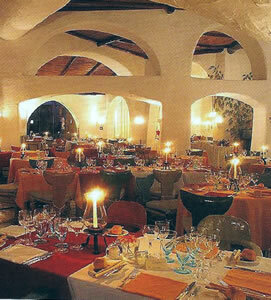 The Cala Restaurant (pictured) shares, but at the ground floor level, the delicious view from the bedrooms. Through its plate glass windows I was therefore able to watch the light gradually fade from the panorama I had enjoyed from my balcony. The twinkling candles and the tablecloths of many colours (mine, on table 31, was white) imparted a rather jolly air to this large chamber. I noted that the glassware was by Inncrystal and by Riedel (the Restaurant range). To my table waiters in short black jackets brought four dishes from the kitchen of Chef Franco Guardone. (For those not on half-board, this meal attracted a set charge of 110 euros.) His approach is to take high quality ingredients and cook them in a skilled and straightforward way. The resulting dishes are enjoyable and exactly right for this context. I began with asparagus and parmesan cheese, topped with a fried egg. Then ravioli with ricotta was served with a tomato and cream sauce. My meat was a local speciality, pit-roasted suckling pig, scented with myrtle – really good meat, full of flavour. And I ended as I like to end, with a big soufflé, divided between myself and my companion. This one was of the Grand Marnier sort, with sauces of vanilla and of chocolate. As you would expect, the wine list is extensive and prestigious, with most of the offerings coming from Italy or France. Plenty of Sardinian wines are available, with prices starting at 45 euros for the ‘Karana’ nebbiolo. Those of you with a taste for the top clarets from good vintages will be pleased to know that you can quaff the following: 1986 Pétrus (1,700 euros), 1989 Mouton Rothschild (900 euros), 1990 Haut Brion (1,050 euros) and 1995 Latour (750 euros). Of the grandest Italians, the following caught my eye: 1990 Barbaresco, Gaja (610 euros), 1988 Sassicaia (1,150 euros) and 1955 Brunello di Montalcino Riserva, Biondi Santi (5,000 euros). Sommelier Pierfranco Lavra, properly dressed in the black uniform of his profession and speaking excellent English, recommended two fine bottles – both from Sardinia and both from the 2003 vintage. My white was a blend of 50% chardonnay and 50% vermentino – big, bold, well-structured, with discreet fruit (Villa di Chiesa, Santadi – 80 euros); and my red was made from the local nieddera grape, with 5% cabernet – oozing ripe black fruit, with a lingering aftertaste (Barrile, Contini – 85 euros). Good drinking. For breakfast the location moved to the restaurant next to the swimming pool. Here each morning friendly waiters (this time in short white jackets) brought to me onion omelettes, pots of good coffee and, of course, my final cappuccino. I took from the buffet Rice Crispies, melon and prosciutto, fruit salad and croissants – all of good quality. One should always start one’s day with a decent breakfast, taken at a leisurely pace. It helps to set a proper rhythm for the time until lunch. 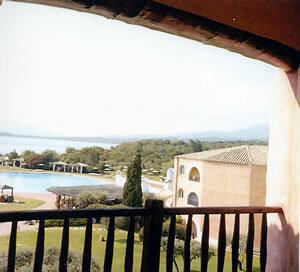 My days at the Cala di Volpe were, indeed, periods of calm restoration and quiet enjoyment. Those of you fortunate enough to be able to make your way to this exclusive retreat will find yourselves much blessed. 07020 Porto Cervo, Sardinia, Italy.